No matter what they call it, we’re big fans of the DIRECTV Genie. Five tuners and all the hard drive space you need, plus the ability to run the tiny Genie Mini Clients. The system was originally called the HR34, but when DISH stepped up their game with Hopper, the folks at DIRECTV decided that it would be cool to give their hardware a new name too. Unlike Hopper, though, the name “Genie” has been used for a lot of things in the past. (Although, you could argue that DISH’s unintended association with actor Dennis Hopper, known mostly for his portrayal of total nutjobs is also a problem.) For Fun Friday, let’s look at a few. I Dream of Jeannie: If you’re over 40 this is probably the association that jumps to mind for you. Barbara Eden’s portrayal of a sultry yet childlike Genie lives on in reruns to this day. The Genie from Aladdin: On the other hand, if you’re under 40 this is probably what jumps into your head. Robin Williams’ crazy Genie from the 1990s film has delighted generations of kids. 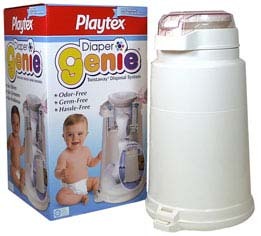 Diaper Genie: This, and its pet companion Litter Genie, are probably two uses of the term that DIRECTV would rather you forget. Genie Francis: First, a little confession: I called my HR34 Francis for a while because of actress Genie Francis. Now that we have a Pope Francis it doesn’t seem quite right. Genie Lift: What you see here is a Genie Lift, a sort of overgrown engine block hoist. Most likely if you don’t work in a factory you’ve never heard of this but if you do, you know what you use it for. GEnie: Before we had the internet we had online services. One of the least popular was this service created by General Electric. It looked nice but you couldn’t do anything with it. Keep in mind this was before cat pictures invaded the online world. “Tell Me Your Wish (Genie)“, a song sung in both Korean and Japanese by Girl’s Generation, and their second Korean mini album of the same title. What about you? When you think of a Genie what pops into your head? How can you find DIRECTV’s live 4K channels?